qualification they are eligible to apply online for this Indian Navy Tradesman Mate TMM jobs recruitment 2019. Candidates selection for this Indian Navy TMM Vacancies will be held on basis of Screening of applications and written exam. INCET TMM Exam Syllabus is also attached with this notification. Online applications for this Indian Navy TMM Vacancies will be available from 02-03-2019 and last date to apply online is 15-03-2019. 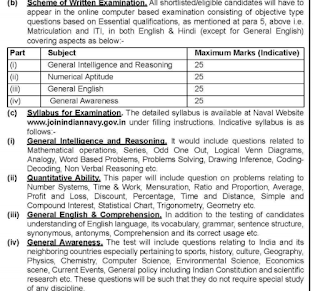 Indian Navy INCET TMM Exam Pattern and Syllabus, Selection Process, age limits, online application form and other details are updated below. There are total 554 TMM Tradesman Mate jobs in this India navy recruitment 2019. Category wise and command wise vacancies are updated below. For UR candidates age limits are 18-25 years and for others age limits are applicable as per the norms. 10th/Matriculation with ITI qualified candidates are eligible to apply online for this Indian Navy TMM Jobs. 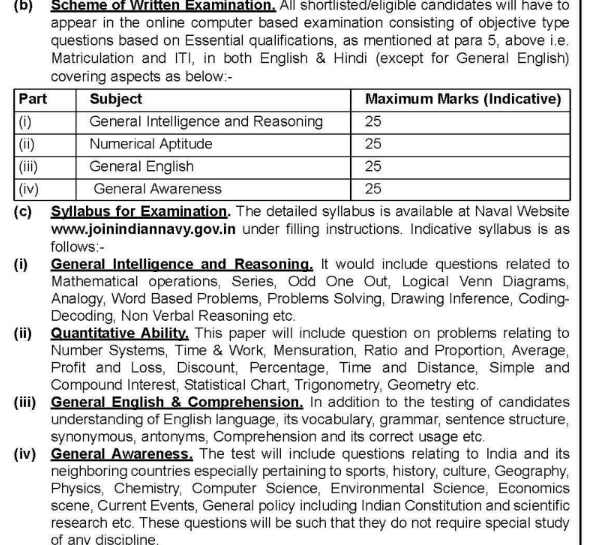 Candidates will be selected based on online exam for this Indian Navy TMM Posts. Exam will be conducted for 100 Marks for this TMM posts. Computer based Online Exam will be conducted. Apply online for this INCET TMM Exam 2019 from 02-03-2019 to 15-03-2019 via the official website of www.joinindiannavy.gov.in or www.indiannavy.nic.in.